Week 7 was pretty good. Once again I only completed 3 blocks. They are the ones I showed in the Sneak Peek posting. This first one I will call 8″ 9 Patch Water Wheels. I found it on Pinterest, but couldn’t find a tutorial. 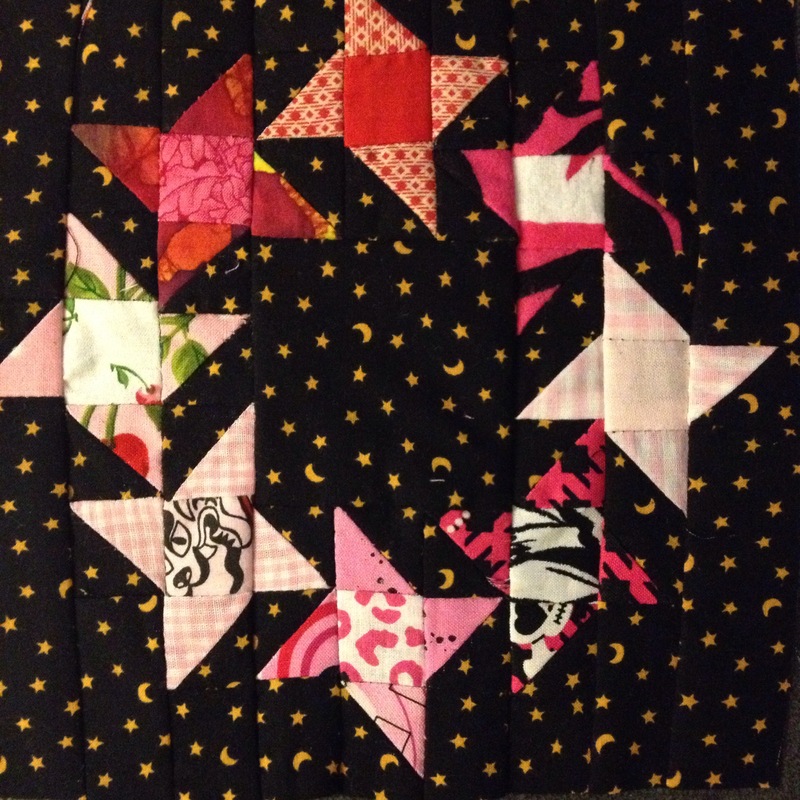 I kept getting snags on the bottom when sewing the HSTs on this one. I tried re-threading the machine, checking the tension, and resetting the needle. Still no go. Then my future M-I-L asked if my needle was too blunt. Sure enough, changed it and it worked beautifully. Oops, it’s been over a year since I did that. I had planned to do mine in many colors but ended up making it with blacks, whites, and pinks. 1. Layout the block pieces so that you know exactly where each colored pin wheel will be. 2. 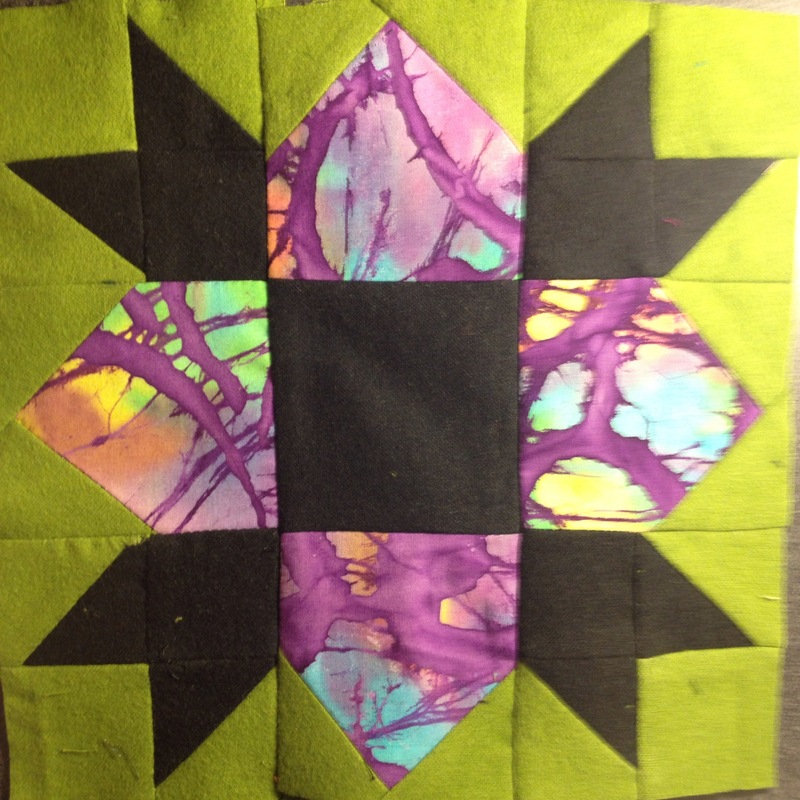 Sew the colored pieces to the background squares to make HST squares. 3. Assemble the first three rows. 4. Sew the 9 patches that are to the left and right of the center block. 5. 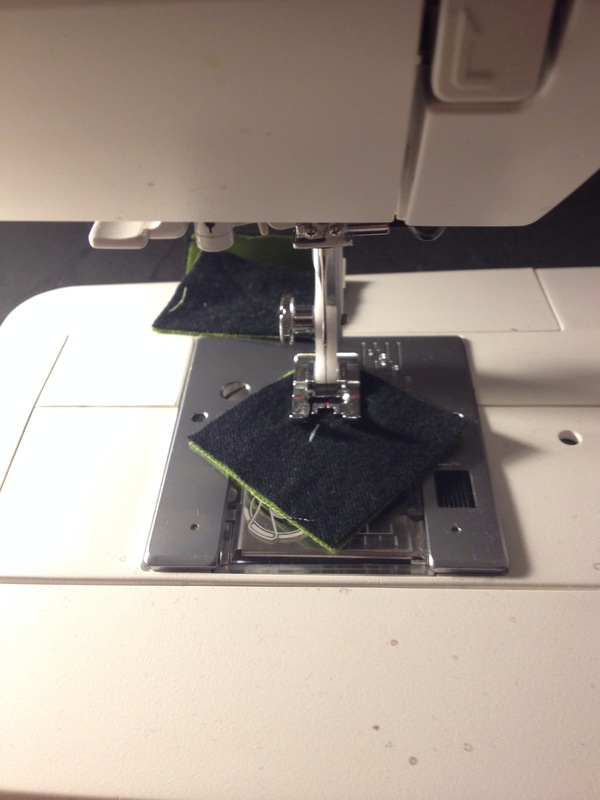 Sew these 9 patches to the sides of the center block. 6. Assemble the last three rows. 7. Sew the top row set to the center set. 8. Sew the bottom row set to the center set. I was blabbing my mouth to my ma when I was coloring this one. I was just grabbing color pencils and started coloring when I noticed that I colored it like a flower. That’s what I get for trying to walk and chew gum at the same time!! So when I made the block, I swapped the colors around. It’s another 9 patch and it’s way easier than the pin wheel block I did above. 1. Chain sew all but 4 of the background squares to the “leaves” on their diagonal to make HST squares. Trim off excess. 2. Sew the corners of the 9 patch like in the picture. HST square to a background square and an HST to a “leaf” square. 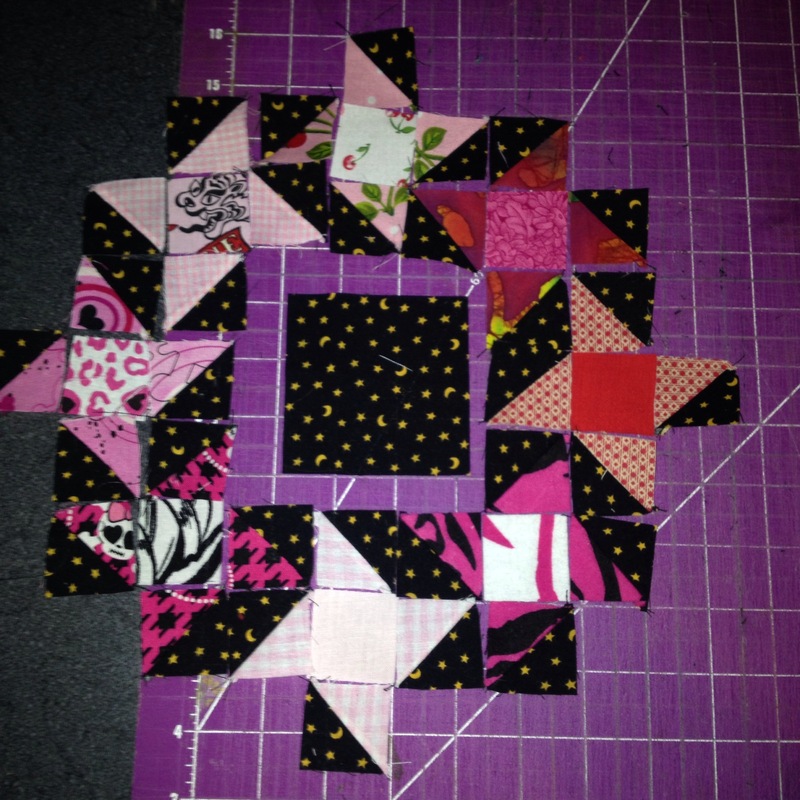 Sew those together to make a square. 3. Sew the side squares of the 9 patch by sewing a background square to 2 adjoining corners of the petal square on their diagonals. The ending result will look like the “petal” fabric is a house shape. 5. Sew the rows together to make the block. Like the picture. I loved sewing this one. 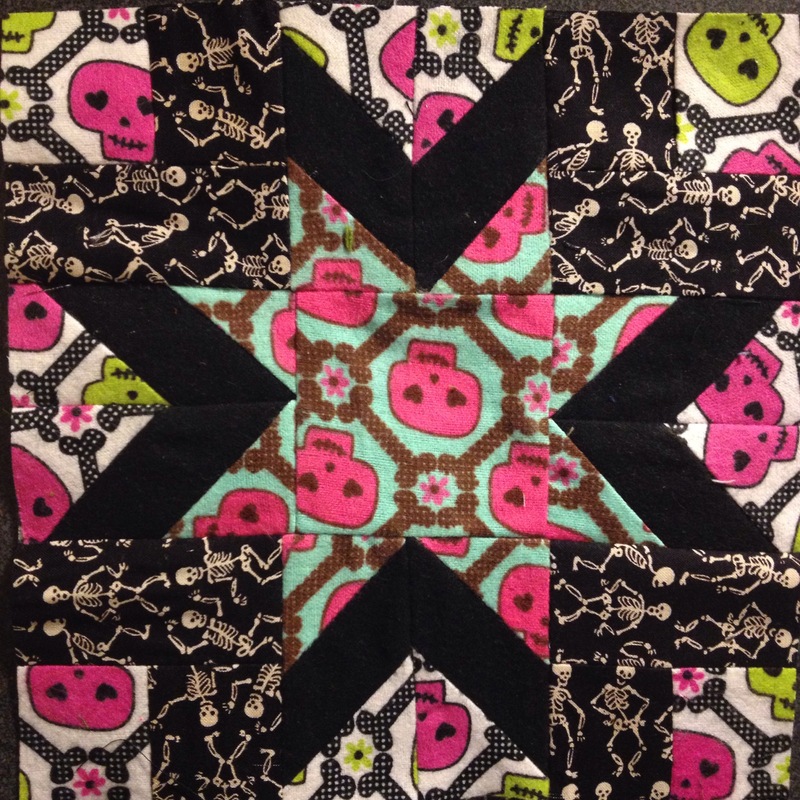 I really wanted the border around the star to pop so I added the black skeleton fabric on the corners rather than making it black like the sides. This is another 9 patch so we will assemble them by each of the 9 squares. 1. Sew the squares together. 2. With color A to the left, sew the rectangle to the bottom of step one’s rectangle. Repeat with the rest of the corners. 1. 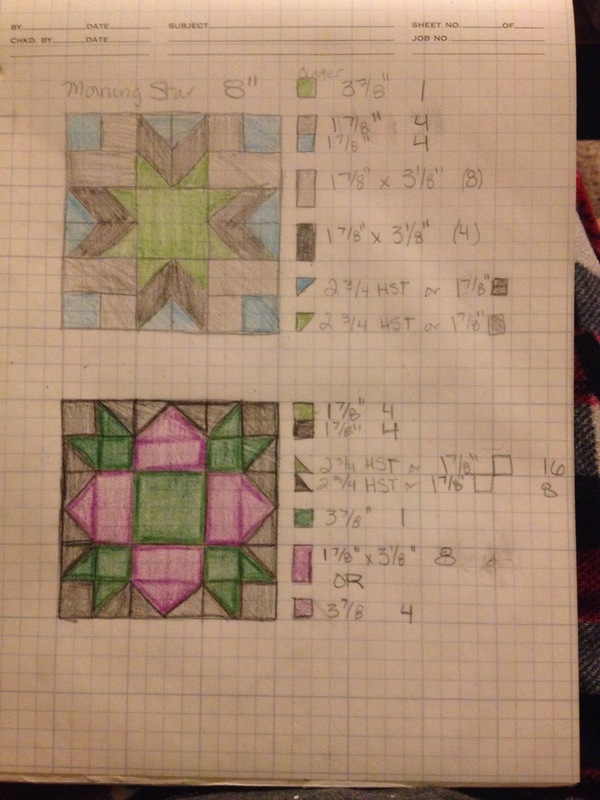 Sew color A square on its diagonal to the top of the color C rectangle. Repeat 3 more times. Trim excess. 2. Sew color D square on its diagonal to the top of the color C rectangle. Repeat 3 more times. Trim excess. 3. Flip the rectangle to the bottom side and repeat steps 1-2 of this section. In the end, each rectangle will have a color A and D on the top and bottom. 4. You have four sets of rectangles that mirror each other. Sew one to the other to make it look like the middle color is making a chevron and the colors line up. See the picture above if that doesn’t make sense. 1. Sew the 9 patches in rows like the picture. 2. Sew the rows together to make the block like in the picture.